BELLEVUE, Wash., 2012-12-19 — /travelprnews.com/ — Expedia.com, one of the world’s leading online travel agencies, announced today that its highly popular Expedia app is launching on Windows 8. The app is available immediately for free download in the Windows Store. 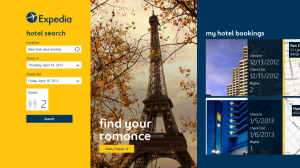 The new Expedia app, highly popular on previously existing platforms, provides Windows 8 users with the ability to book hotels in a flash. With more than 140,000 hotels to choose from and the ability to save up to 60% off with Expedia exclusive mobile deals, the Expedia app for Windows 8 provides users with both great options and great deals. One of the only apps for Windows 8 users offering mobile exclusive deals. For consumers using Windows 8, they will have special access to Expedia’s mobile exclusive deals that can yield savings of up to 60% off. Earn valuable Expedia Rewards points with booking. When booking with the new Windows 8 app, users can earn valuable points to redeem flight and hotel bookings through the Expedia Rewards program without the worry of blackout dates. Leverage valuable customer insight when booking through Verified Reviews. Users of the app will have access to more than a million Expedia vetted and verified travel reviews written by actual Expedia travelers. Ability to search real-time inventory. The Expedia app for Windows 8 has urgency messaging showing users in real time how many rooms are available at a certain property at a certain price point. Expedia for Windows 8 also ensures users can book with confidence, knowing they are getting the best rate available thanks to Expedia’s Best Price Guarantee policy. The app also makes hotel planning easy with a special hotel itinerary management tool. Expedia.com is the world’s leading online travel site, helping millions of travelers per month easily plan and book travel. Expedia.com (http://www.expedia.com/, 1-800-EXPEDIA) aims to provide the latest technology and the widest selection of vacations, flights, hotels, rental cars, resorts, cruisesand in-destination activities, attractions, services and travel apps. With the Expedia Best Price Guarantee, Expedia.com customers can get the best rates available online for all types of travel. Whether you want to relax in Myrtle Beach, ski in Vail or swim in Bora Bora, we know every trip and every traveler is unique and we want to help you Find Yours™. Expedia, Expedia.com and the Airplane logo are trademarks or registered trademarks of Expedia, Inc. in the U.S. and/or other countries. © 2012 Expedia, Inc. All rights reserved. CST # 2029030-50. This entry was posted in Business, Hospitality, Hotels, Tourism, Travel, Travel Apps, Travel Management, Travel Services, Travel Tech, Travelers. Bookmark the permalink.